Precision huntingtin-lowering drug trials target the mutant protein - HDBuzz - Huntington’s disease research news. A new exciting chapter in Huntington’s disease (HD) treatment is just beginning – WAVE Life Sciences have announced PRECISION-HD1 and 2, clinical trials of two new drugs that lower the mutant Huntington’s disease protein. We’re excited about this novel approach to huntingtin lowering therapies, but these are early days and we’ve got a long way to go to show they’re safe and effective in people. Why are we trying to lower the amount of huntingtin protein? If genes are the instruction manual that our cells use to make our body, then DNA is the language that the manual is written in. Each chapter makes a different protein, and it’s these thousands of different proteins that make up all the cells of our body. 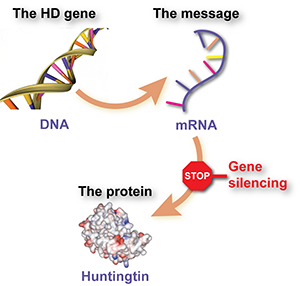 Officially, the HD gene is called HTT and the protein whose instructions it contains is called huntingtin. The WAVE ASO acts like a drone that wants to shoot down the bad HD gene, or kite, but can’t tell the difference between the good and bad kites. However, it can recognise the different coloured ribbons in the tail. Shooting at the ribbon instead of the kite is good enough to take down the whole thing. Humans have two copies of the HTT gene, HD happens when a mutation makes one copy too big. The expanded protein made from this mutant copy of the gene is toxic to our cells, particularly those in the brain. We know that lowering the level of mutant huntingtin protein in HD mouse models significantly improves symptoms reminiscent of HD, providing hope that similar treatments in people may be effective. In the same way we’ve done with many antibiotics and cancer drugs, we can take advantage of one of nature’s natural processes in order to suppress the huntingtin protein. In this case it’s a means by which cells maintain and copy their own DNA. The DNA found inside of our cells is usually made of two intertwined strands of DNA, curled around each other in the well-known double helix form. These paired strands allow the cell to replicate or copy their DNA by pulling apart each strand and using it as a template for a new copy. At various points in this process, cells use RNA as a sort of scaffold to help replicate DNA. When the copying is done these scaffolds need to be removed, so cells have gotten really efficient at degrading bits of RNA and DNA bound together. 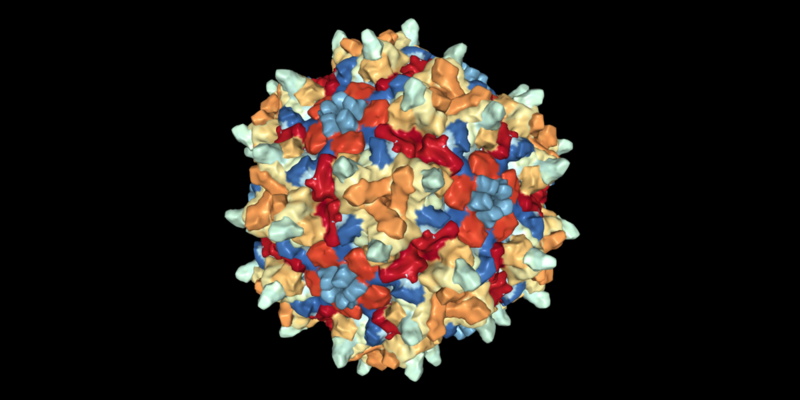 Cells use RNA for another purpose, which is carrying genetic messages throughout cells. When a cell needs a specific protein - say, the Huntingtin protein - to carry out their function, a request is sent to cells DNA managers. DNA is precious - if we screw up our DNA we end up with cancer, or dead - so the cellular managers of the DNA make a copy of the requested gene. The copy is made not in DNA, but in the language of RNA. This RNA message - called mRNA - is used by the cells manufacturing plants to create more huntingtin protein. This intermediate mRNA shuttling information between DNA and protein-making machinery is the target of huntintin lowering drugs. The goal of these drugs is to, in various ways, destroy this message, denying the protein making machinery of the cell the instructions for making a specific protein. What does this have to do with HD? Enter antisense oligonucleotides, or ‘ASOs‘. ASOs don’t occur naturally, but are made by scientists to trick the cell into destroying a specific messenger RNA molecule. Essentially, ASOs resemble short stretches of DNA that have been modified to be able to enter cells. Once in, the ASO sticks to one specific sequence, found only in the messenger RNA of the HD gene. Remember the scaffolds for copying DNA and how they’re cleaned up? When cells see a stretch of DNA (the ASO, in this case) stuck to a piece of RNA (the HD message), they think it’s a bit of scaffolding left over and destroy it. Voila, we’ve tricked a cell into destroying just one of the many tens of thousands of RNA molecules found inside that cell. A major challenge is getting these manufactured ASOs into the brain because they can’t get across the walls of the blood vessels in our brains. We’ve been able to get around this by injecting them directly into the cerebrospinal fluid (CSF), the fluid surrounding and cushioning the brain and spinal cord. From there, the ASOs get taken up into brain cells where they continue to suppress their target protein for a month or so, after which time more needs to be injected. How is this different than the ongoing ASO trial? Ionis pharmaceuticals are currently nearing the end of an exciting clinical trial using an ASO that targets the huntingtin RNA. The Ionis ASO doesn’t distinguish between RNA coming from the normal and mutant copy of the gene, so it lowers the amount of both the normal and mutant protein. This is one of the reasons we’re moving forward so carefully with this treatment – lowering the amount of normal protein may well be safe, but could also potentially be harmful in the long term. We know having the normal protein is really important for a baby’s development. However, studies in several animals have shown that partially suppressing both normal and mutant versions by about 50% in adults is safe and improves symptoms. What WAVE has done might get around these issues because their two drugs specifically target the mutant gene, leaving the normal copy alone. They do this by aiming for little genetic differences in DNA called single nucleotide polymorphisms, or ‘SNPs’ (pronounced ‘snips’). Think of these SNPs as different coloured ribbons hanging from a kite. Everyone with HD is flying two kites – a ‘good’ one and a ‘bad’ one. 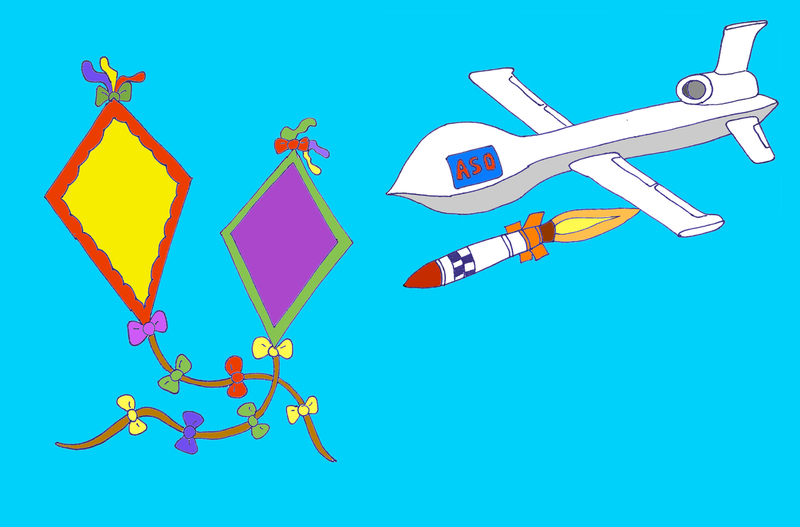 Imagine the ASO as a drone that wants to shoot down the bad kite. Unfortunately, the drone can’t tell the difference between the kites themselves. However, it can recognize the different coloured ribbons in the tail and shooting at the ribbon instead of the kite is just as good in terms of taking down the whole thing. WAVE designed ASOs that target two SNPs in the HTT gene, which is why they’re launching two separate clinical trials. These SNPs were chosen because their sequences tend to be different in the normal and mutant HTT gene: the ribbons at that point in the good and bad kites’ tails tend to be a different colour, distinguishable by the drone. At the location of the first SNP, which in scientific language is called ‘rs362307’, half of HD patients have different coloured ribbons in their good and bad kites. For the second SNP, ‘rs362331’, there are different coloured ribbons in 40% of HD patients. Overall, at least two thirds of people with HD in Europe and the US should have different ribbons that allow one of these drugs to shoot down the bad kite. We know that lowering the level of mutant huntingtin protein in HD mouse models significantly improves symptoms reminiscent of HD, providing hope that similar treatments in people may be effective. Unfortunately, that means that about one third of people have the same ribbons at these points on both the good and bad kites, so these drugs wouldn’t specifically target the mutant HTT gene. However, should the drugs work in people, there would be a strong incentive to look into developing new ASOs targeting other ribbons. What’s the evidence that these drugs will work? These trials from WAVE are slightly unique, because the company has not conducted studies in HD animal models with their specific drugs. Mice, and other animals loved by researchers, also have two two copies of the HD gene. However, there’s a lot more genetic variation between humans and mice than there is amongst humans. This means the SNP variations targeted by WAVE’s ASOs aren’t shared with mice, and so can’t be tested in them. What has WAVE done? The specific drugs designed by WAVE have been tested in cells in a petri dish, where they successfully lowered the mutant protein whilst leaving the normal version relatively untouched. Researchers at WAVE reason that - for HD - the case for lowering the HD gene is so clear that additional animal studies would be a waste of time. This doesn’t mean these trials aren’t safe - before any drug is administered to people, even experimentally, it must be throughly tested in animals to ensure it is not toxic. WAVE haven’t publicly detailed the work they’ve done in animals to prove these drugs are nontoxic, but rest assured that the regulatory agencies in charge of letting these trials go forward will have seen the results of such experiments. How are the trials organized? The WAVE trials are officially called phase 1b/2a trials. A phase 1 study is one in which the primary goal of the study is to understand whether the drug is safe in a small number of volunteers. Normally, a phase 2 study is conducted in a slightly larger number of people, with the goal of collecting a little bit of evidence that the drug may work. In this case, because everyone wants to move as quickly as possible, WAVE have structured the trial to combine aspects of a phase 1 and 2 trial. This means that they’ll test to see if the drug is toxic (phase 1), but also if it has an impact on various important symptoms of HD (phase 2). Similar to the ongoing Ionis trial, WAVE’s drug will be injected into the CSF by lumbar puncture. This allows researchers to collect a little bit of the spinal fluid that surrounds the brain and spinal cord, in which we can now measure levels of the harmful huntingtin protein. We hope this will allow WAVE to actually measure what they’re trying to do, which is to reduce the levels of the mutant huntingtin protein in the brain. How can someone get into the trial? WAVE aims to recruit 50 people with HD worldwide onto each of the two trials. That’s a small number, but if the drug is safe they’ll move on to bigger trials with more people to look at whether it’s actually working. The current study will start in Canada, then will enrol patients in Europe and the US. To be considered, you have to be an adult over the age of 18, and must have started developing symptoms. There’s no way to tell what colour the ribbons in your DNA are just by looking at you, so eligible people will have a genetic test and if they have either of the two SNPs they’ll be included in the trial. 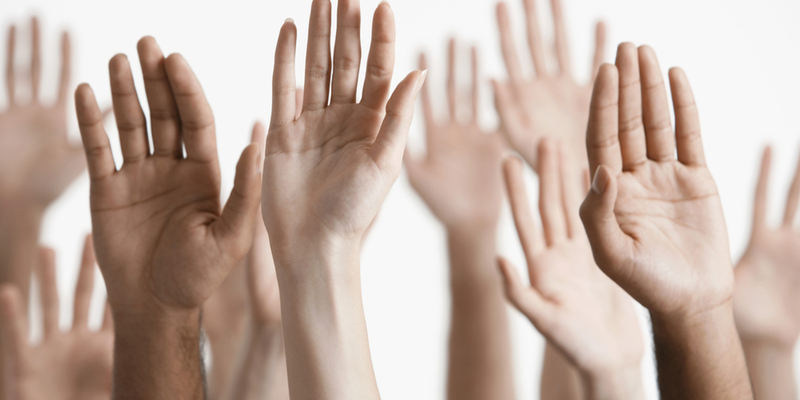 The best way to get involved is to express your interest in research to your clinical team. We’re all hopeful that the Ionis ASO will be the first drug to slow down or stop HD. However, it’s important to realise that this is the first time these drugs have been used in people. Though they made mice much better, humans are a very different species. Even if they do lower protein level in adults, they may not be effective because damage done earlier in life is irreparable. They could also have side effects in humans that didn’t happen in mice. Whilst WAVE’s drugs shouldn’t affect the level of the normal protein, they might react with other RNAs causing their protein levels to be reduced. However, we’re excited and optimistic about huntingtin lowering treatments, and WAVE’s latest refinement looks like it could be a an exciting advance. single nucleotide polymorphisms a single-letter spelling difference in a gene. SNPs, pronounced 'snips', are common and most don't change the function of the gene.